June | 2018 | H.A.W.K.S. After breakfast in the hotel we headed for Bovington. Friday was “preview day.” Tankfest is officially Saturday, but getting there on Friday allowed us to see the museum and all the additional vendors brought in for the day. Since most of the people were out watching the tanks drive around the track, the museum was pretty empty most of the day, which was great. I took over 500 pictures on Friday, but I’ve only included 25 or so in this blog post. That isn’t really enough time to even hit the highlights. Suffice to say, it was a great day. We took our time, read all the signs, had a chance to talk to some of the reenactors, and just immerse ourselves in the development of tanks. It is really cool to see in person tanks you have only seen in pictures. It really gives you a sense of scale. The small tanks are really small, and the large tanks are really large. The magnitude of the differences really hits home when you get to see them in person, stand next to them, and touch them. The initial exhibit traces the development of tanks in WWI. I think we spent more than 90 minutes in just this section of the museum. In many cases, there were glass windows cut into the WWI tanks so you could look inside them. In other cases you could walk through them. After the WWI exhibit, you enter the Hall of Tigers, dedicated to Tiger Tanks. I found this sign particularly interesting. As the Tiger tank was so iconic, it is interesting just how few there were of them. After the Hall of Tigers, we entered the WWII floor. Again, I took over 500 photos, but I am only including a few. It is very difficult to imagine the size of the museum and all the really investing vehicles on display. A duplex drive (DD) Sherman tank in the Hall of Tanks. You can see the Sherman through the window they have cut into the canvas skirt. A cutaway view of a British tank lets you see just how crowded a tank can be. Then we entered my favorite part of the museum, the Hall of Tanks. This traces the early development of the tank (on the left) through the Cold War (on the right). There are a number of displays that allow you to view archival footage of many of the vehicles. Note that despite this being Tankfest weekend, the crowds were low inside the museum. One of the interesting displays what was not here last year is a display of tank concepts throughout history. There were probably 30 on display, but I only provide pictures of two here. A French, Char-B on display. There are a number of visiting, refurbished or reproduction tanks on the display, including those pictured. Most of these are supposed to be driving around the track on Saturday. There were a number of re-enactment groups set up around the periphery. Some of the groups were very happy to interact with you. Others seemed somewhat standoffish. I have two of these for gaming, but this is the only time I have seen an airborne armored jeep in person. Some weapons on display with the 29th infantry. You don’t often see some of these weapons. The “barn.” As with most museums, a fair number of the artifacts cannot be put on display. For Tankfest this additional storage area was open to the public. An thus ended our first day at Tankfest. After an uneventful ride back to Poole, we had dinner in a local gastropub, watched a couple episodes of Hogan’s Heroes, and went to bed relatively early. The next morning we checked out of our hotel, left our bags at the front desk, and got on the train. Our intent was to hit the Churchill Cabinet War Rooms, the Imperial War Museum, and (if time permitted) the National Army Museum. After an uneventful tube right to Westminster, we headed for the War Rooms only to find out that the wait was over two hours and that we should have booked our tour ahead. I have been here before, and there has never been a wait, but apparently the recent Churchill movie has made the War Rooms immensely popular. So we walked to the Imperial War Museum. The Imperial War Museum is free. The lowest floor is mostly WWI, and it is quite well done. It hadn’t changed — that I could tell — since I was here with my family last Summer, but it is nonetheless very nice. I took a WWI class at West Point, and it is hard for Americans to grasp the impact of WWI on the British and the Commonwealth, where almost an entire generation was killed in France. We had planned to spend 90 minutes here and then head to the National Army Museum. After two hours we had just completed the WWI section. We decided to take the short, guided tour. This tour highlighted displays on the first three levels of the museum. Silhouettes of soldiers on a trench wall in the Imperial War Museum. The tour was short but informative. After a short break for lunch in the cafe, we had about 45 minutes to take in some of the other exhibits before heading back to Paddington and our hotel to pick up our bags. This was one of the more interesting displays for me, since I just bought one for gaming hypothetical Sea Lion scenarios. It fired a 6-lb armor piercing shell that was useful out to 50 meters and an HE (anti personnel) shell out to a couple hundred meters. When tipped on its side, the lower wheel became the traverse mechanism and the upper wheel provided some overhead protection. So, we had intended to stay 90 minutes. After four hours we hadn’t seen everything, but we had to get on the road. We took the Great Western Railway train to Burnham where after another short walk (to Don’s dismay) we arrived at Enterprise to hire a car. Most of us packed lightly, but Eric brought a steamer trunk, so I was a bit worried about whether we were going to fit. While I filled out the paperwork, Duncan, Eric, and Don Tetrised our stuff into the boot. I have to say that driving on the left side of the road is much easier the second time around. In two hours we arrived in Poole and checked into our hotel. Our hotel in Poole (a Holiday Inn Express). This is the only hotel we stayed in for two nights. In London at the Mitre House, we could barely fit into the room, but the room here at the Holiday Inn Express in Poole was quite spacious. We then took a mile walk to the seaside where we had our choice of several pubs and restaurants for dinner — along with some football hooligans. We got to bed quite later (nearly 2300 GMT). On the way back to the hotel, we passed this statue of Lord Baden Power, the greater of Boy Scouts. Arriving at our hotel in London. Last year, I came to England with my family, and we had a great time. A highlight for me was a visit to the Tank Museum in Bovington. As with many museum visits, my family patiently put up with Bovington for a couple of hours and then kept hinting that it was time to leave. So, I suggested that some of my wargaming buddies and I should head to England for Tankfest at Bovington and while there visits to some other military history museums. Candy did the lion’s share of the work to pull this together. Our first, very, very long day involved the flight to London, train to Paddington Station, and check in at our hotel. The we took a somewhat eventful tube ride to Greenwich. I didn’t realize how far apart the North Greenwich and Greenwich tub stops were or that we had to transfer to the DLR. Then none of the locals could tell us how to get a bus ticket to complete the trip. So after a little floundering, we arrived at the Maritime Museum. The Maritime Museum is free. We spent about two hours here, and we were able to see most of what was on display. A handsome and study visitor to the Royal Maritime Museum. A WWI era motor torpedo boat. I found this model of a WWI-era motor torpedo boat very interesting. A few years ago I wrote a set of wargaming rules for motor torpedo boat games in WWII. I knew there were motor torpedo boats in WWI, but I had never seen one. I am not sure how the torpedo was launched since it is facing into the boat, but I suspect the propellors were wound up, the torpedo was dropped, and the boat veered quickly to the side. The main deck of the Cutty Sark. After the Maritime Museum, we decided to visit the Cutty Sark, which was once the fastest ship in the world. We entered the Cutty Sark in the cargo hold, visited the tween deck, walked the main deck, and visited some of the cabins. In the officer’s ward room aboard the Cutty Sark. The ship was interesting, and there were some nice informational signs. There were no docents to help explain things or answer questions. Unlike the Constellation in Baltimore, there was not audio self-guided tour. At 13 GBP, I thought there would be more explanation, but it was nonetheless a worthwhile experience. The underside of the Cutty Sark. Note how the ship’s hull does not touch the ground. It was jacked up to prevent the hull from warping. After the Cutty Sark, we stopped in a pub for dinner. We were all beginning to run out of steam. Duncan, Don, and Eric at the Globe theater in London. Don had just take a happy pill. In an effort to get our bodies on Greenwich Mean Time, we decided to attend a play in the Globe theater in London before returning to our hotel. We saw the Shakespearean play A Winter’s Tale. We were all fading, so keeping up with the rapid, Elizabethan dialog and the proper accents was something of a challenge, particularly since I didn’t know the play. Last time in the Globe I saw The Taming of the Shrew, which is one of my favorite Shakespearean plays, and I liked that better, but it is always interesting to attend a play in the Globe. This concluded day one. We went back to our hotel after a longish walk along the Embankment to Waterloo Station and a short train ride to Paddington. All the old timers said they had had enough walking. Duncan’s fit bit measured us at nearly 18k steps. Like nearly all the supplements, this one is free. 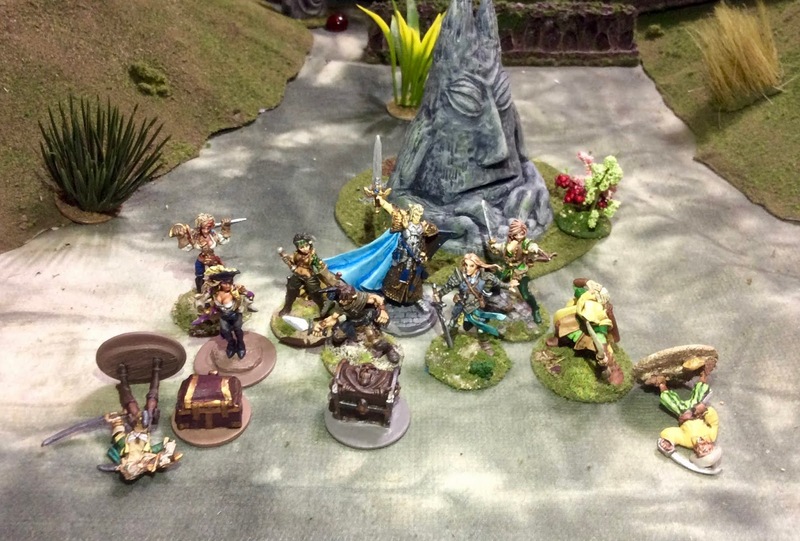 Chris Palmer A couple weeks ago I ran a game using my old GW “Skull Pass” Dwarves. 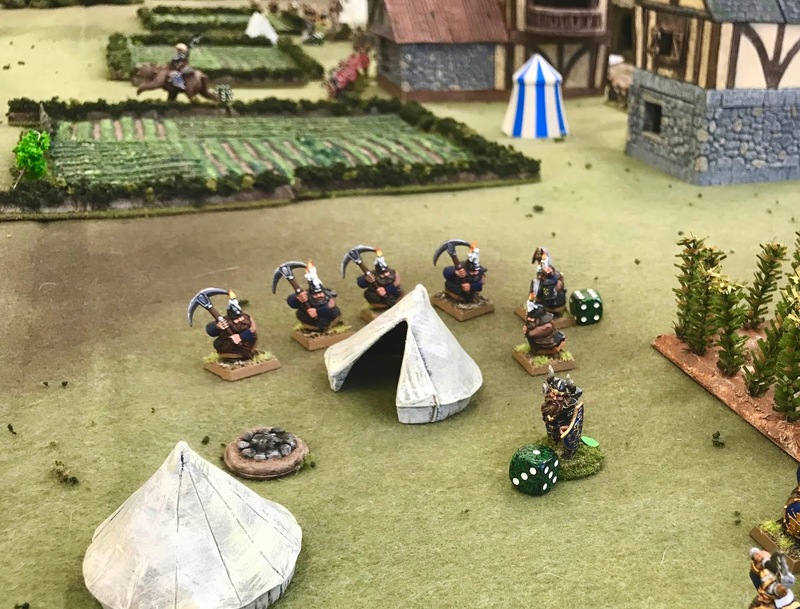 I had a unit of 6 of the Dwarves with pickaxes on the field, and one of the players remarked that there should be seven of them. 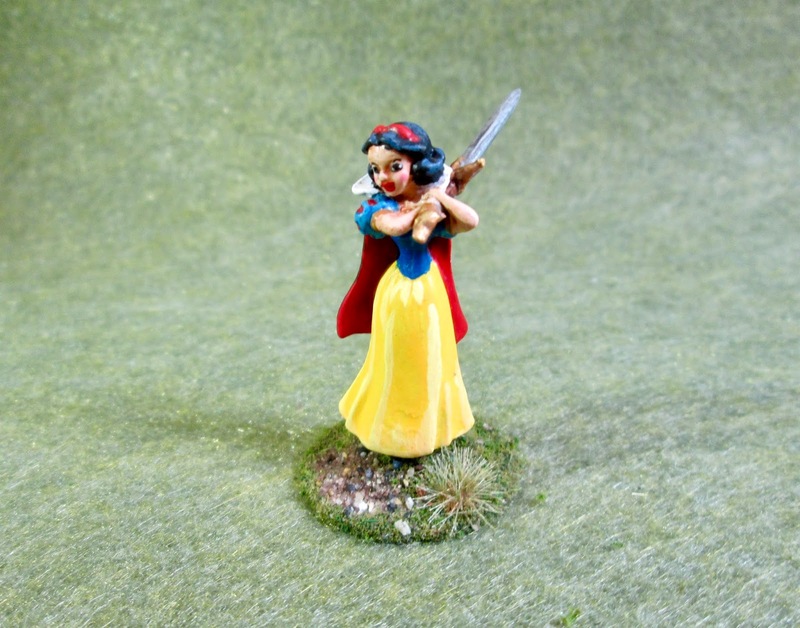 To which another replied that, yes, and they should be led by a certain Disney princess. 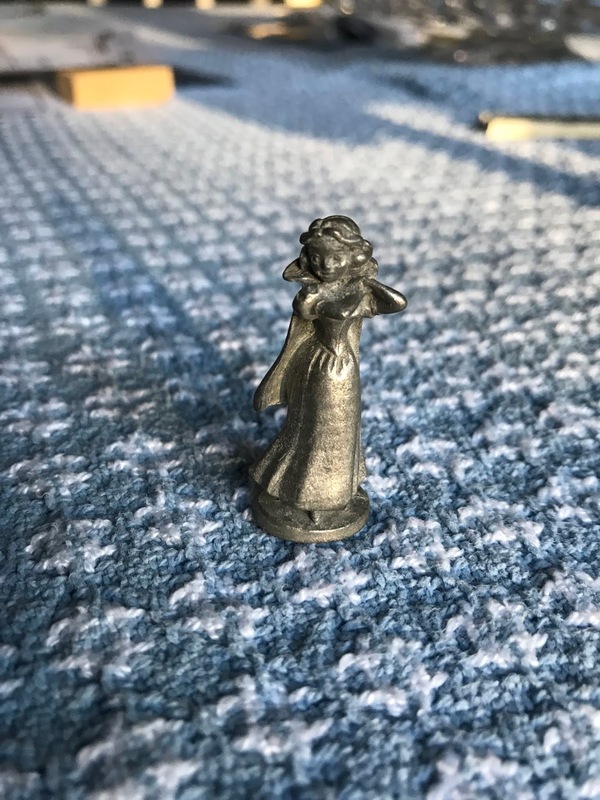 That sparked a memory that my friend, Duncan, had found a baggie of Disney monopoly pieces in a flea market a few years ago, and had given them to me thinking I could us them for one of my games. 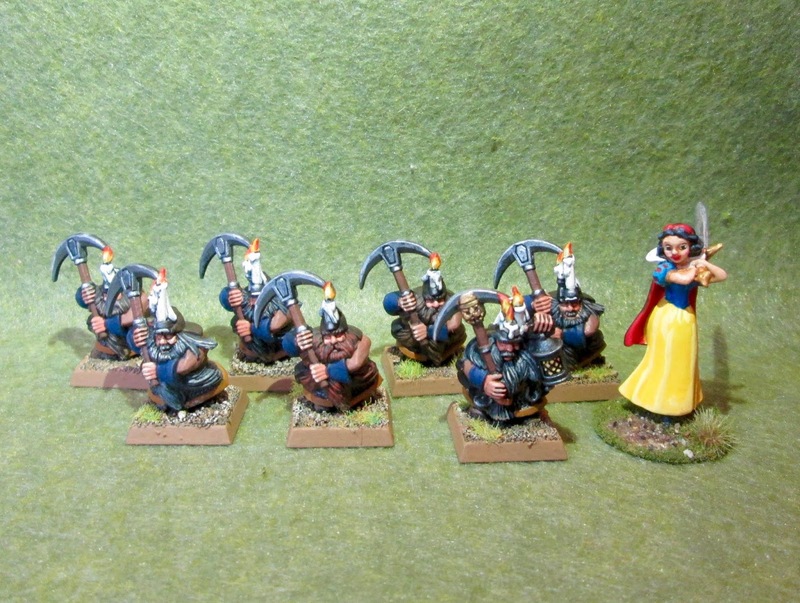 I had put them aside not having an immediate use, but I thought that there might be a Snow White figure in among them; and sure enough when I checked the next day, I found just what I wanted. What’s more, her hands were clenched up by her left ear, in a pose that looked just waiting to have a 2-handed sword inserted into them. Now if only the metal wasn’t too hard to drill through. And to my luck, it wasn’t! It was a nice soft metal and I was able to put a hole through her two hands quite easily. 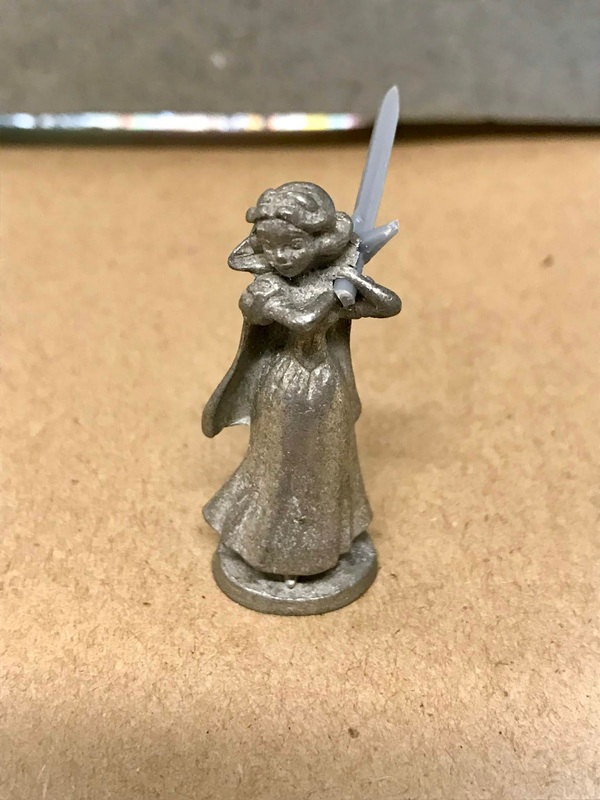 I then looked through the weapon sprues I had received from the Bones 3 Kickstarter and found a suitable sword, and test fitted it. 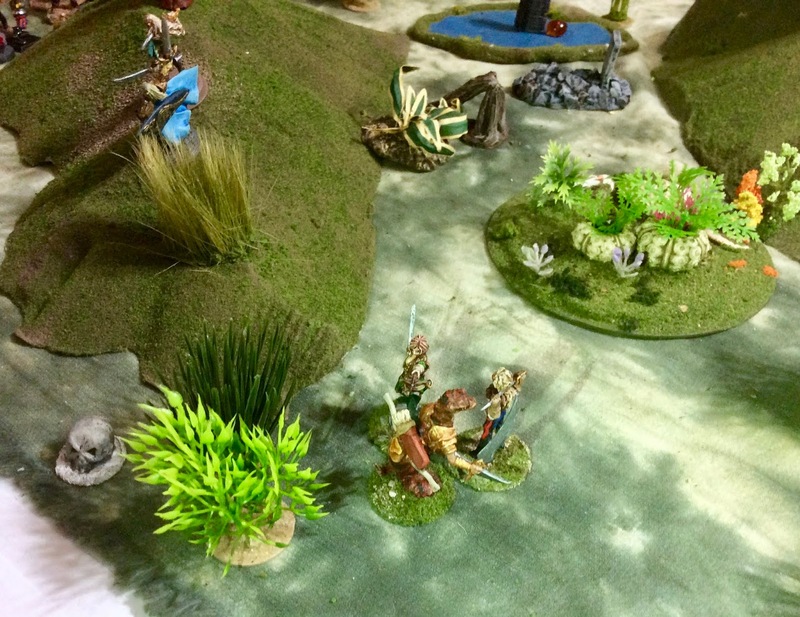 I then glued the figure to a 1" washer, and primed it; and when it was dry, I glued in the sword. 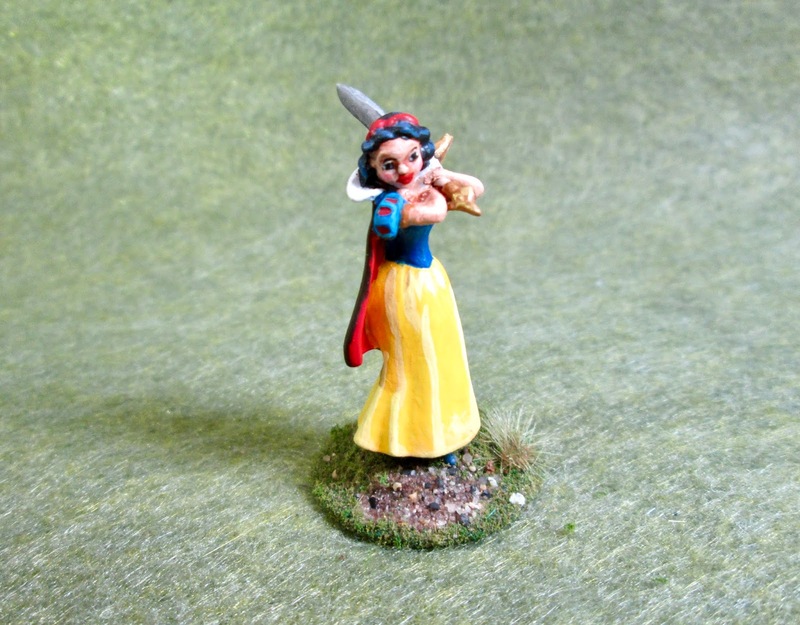 Next, it was an easy task to Google some images Snow White to get the colors right, and with those in hand I painted her up. After painting, I flocked her base, and sprayed her with some Testor’s Dullcote. 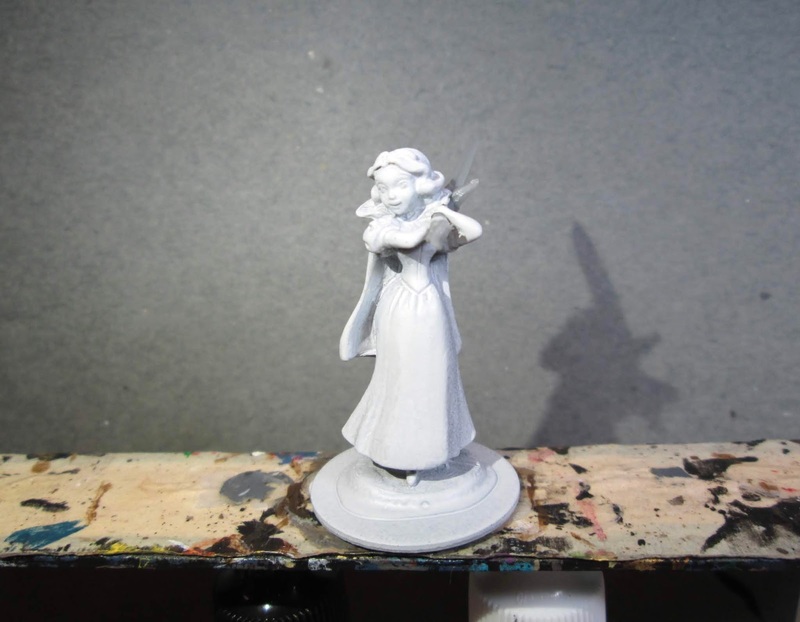 I’m really happy with the way she came out, and I loved doing her primary color outfit; so much so that I’m seriously considering using it on one of my Reaper Bones female fighters now. 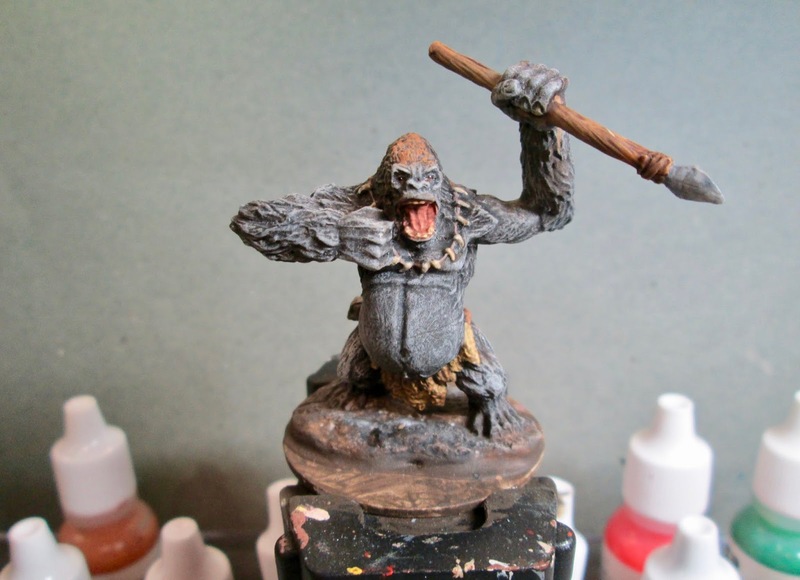 This past week I painted the Weregorilla from the Bones 3 Lycanthropes II set. 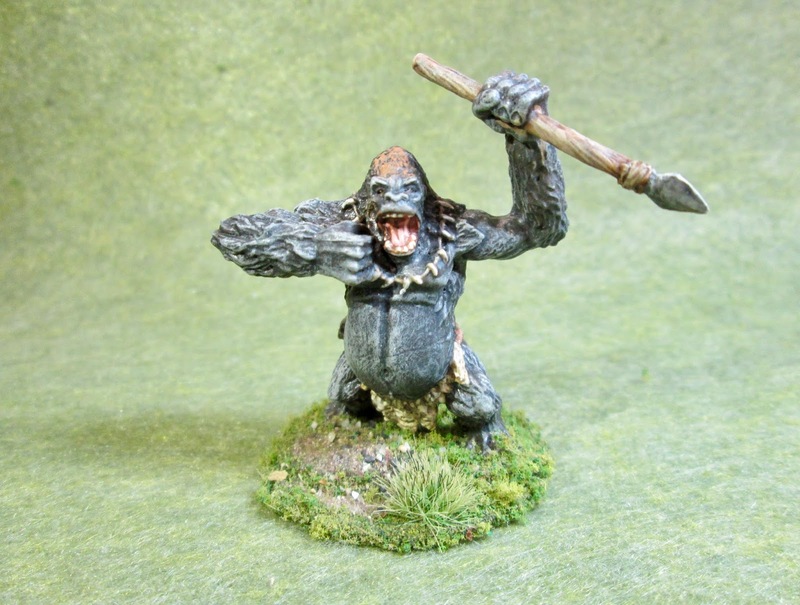 We had been needing a good Gorilla figure for our Ghost Archipelago games, and this one seemed like it would fill the bill nicely, as there didn’t seem to be anything about him that screamed “Were”-creature. 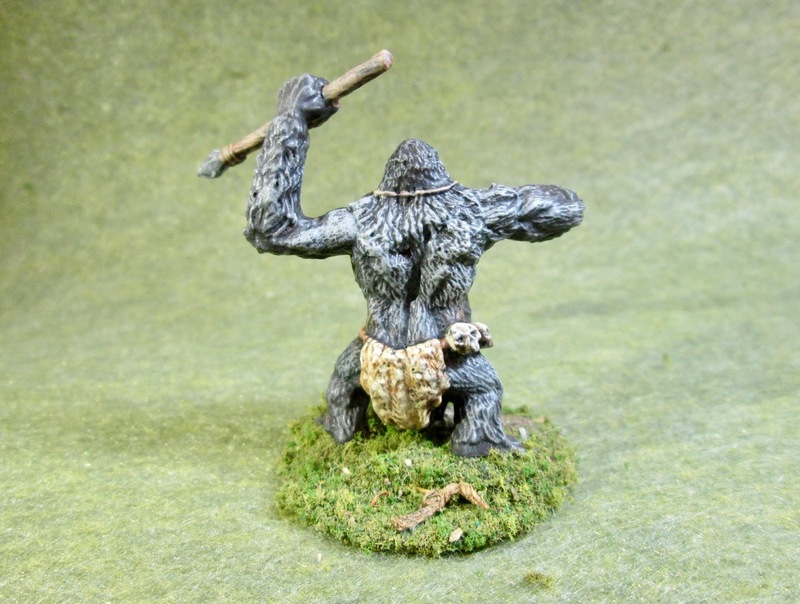 He just looked like a slightly higher evolved Gorilla, which was fine in my opinion for a Fantasy setting. I prepped this figure in the usual way; soaking it in a dish of water with a couple drops of dish-soap added, then giving it a light scrub with a soft toothbrush, and then rinsing and drying it. 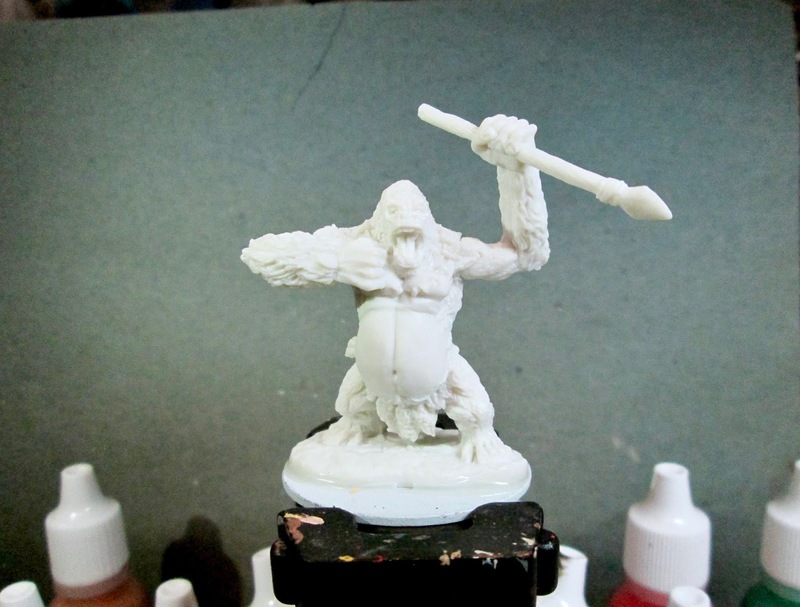 I then glued the figure to a white-primed 1.5" fender washer with Aleene’s Tacky glue. I then placed the figure in my painting grip. I began by painting the whole animal, and the base for that matter, with Americana “Bittersweet Chocolate”. When it was dry, I gave it a heavy wash of Citadel “Nuln Oil” wash. 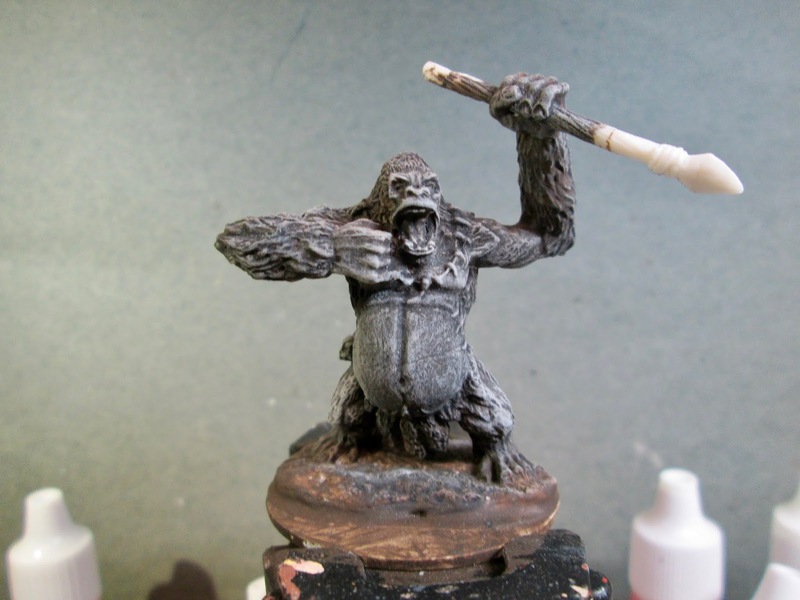 I then drybrushed the gorilla with Americana “Neutral Grey”, followed by Crafter’s Acrylic “Storm Cloud Grey”, and lastly, mainly on the back and highpoints, Americana “Grey Sky”. Next, I added a little drybrushed ares of crafter’s Edition “Spice Brown” followed by Americana “Terra Cotta” to the top of his head and lightly to his hips. I then painted the inside of his mouth with Americana “Shading Flesh”, and then did his teeth and the teeth on his necklace with Americana “Antique White”. After that, I painted the string the necklace teeth are strung onto with Ceramcoat “Territorial Beige”, and the cord his loin furs are on with Americana “Mississippi Mud”. I followed that with painting the loin furs with Apple Barrel “Apple Maple Syrup”. 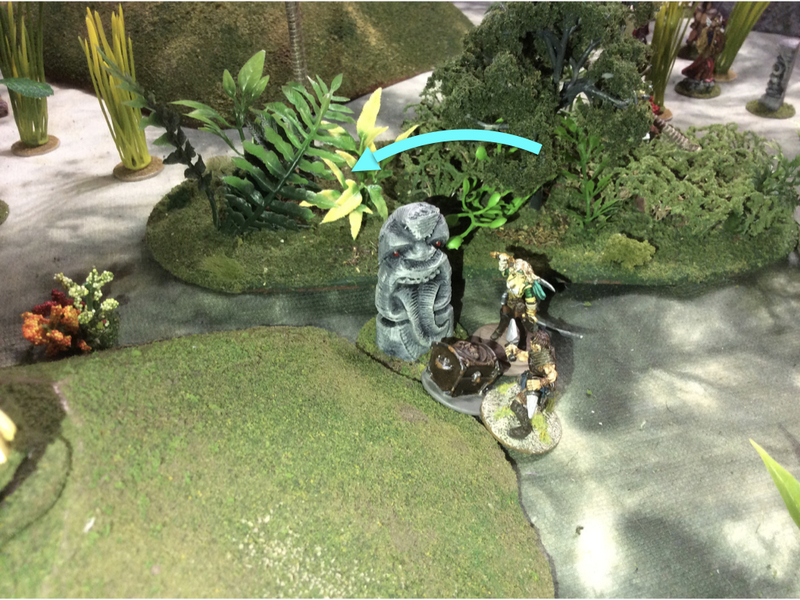 I then painted the spear with the “Territorial Beige”, and the cord holding the spear point with Reaper MSP “Olive Skin Shadow”. 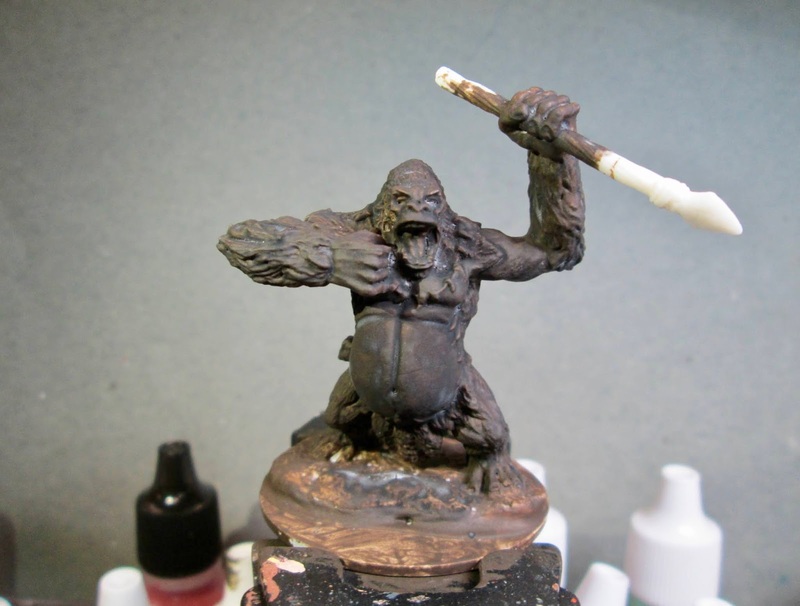 Then when everything was dry, I gave his mouth, the necklace, the loin cloth, and the spear shaft and cord, all a wash with Citadel “Agrax Earthshade"wash. When the wash was dry, I went back and gave the skulls a wash with some of the "Nuln Oil” wash. I then painted the spear point with Americana “Zinc”, and then did his eyes with Accent “Real Umber”, with some White pinpoint highlights. Next, I highlighted the tongue and inside of the mouth with a bit of Crafter’s acrylic “Cherry Blossom Pink” mixed with some of the “Shading Flesh”. I then highlighted the gorilla’s teeth, and the the ones on the necklace, with Crafter’s Acrylic “Light Antique White”; and I finished up the necklace by highlighting the string with some Folk Art “Butter Pecan”. After that I highlighted the fur on the loincloth with some of the base “Apple Maple syrup”, mixed with a little Americana “Buttermilk”, and I highlighted the skulls with some Folk Art “Porcelain White”, and a little of the “light Antique White”. 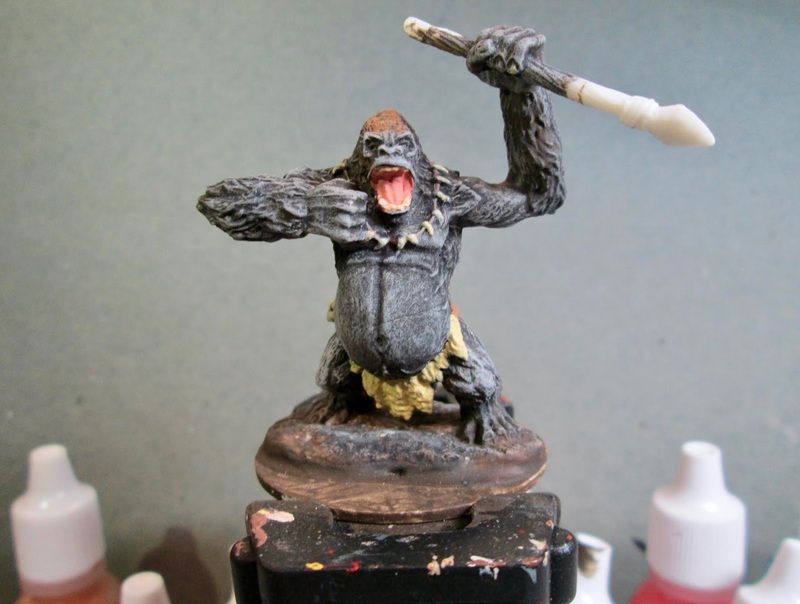 I then completed the Loincloth by highlighting the cord with some Americana “Sable Brown”. I moved on to the spear, giving the point a hit with the “Nuln Oil”, and then highlighting the shaft with Americana “Khaki”, and the cord with Reaper MSP “Olive Skin Highlight”. I then did some highlights on the spearpoint with Apple Barrel “Rock Grey”. Over the weekend and this week I finished my Drantakh force. 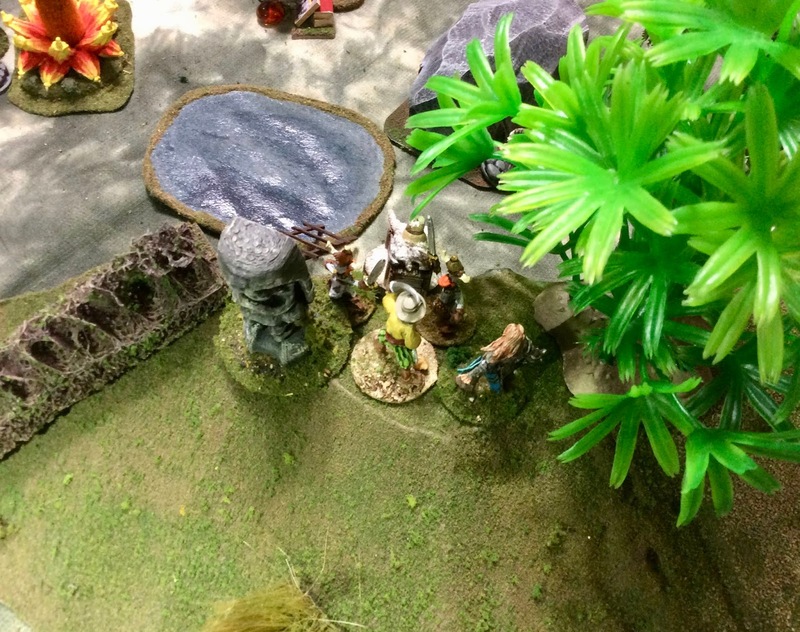 The Drantakhs are figures manufactured by Badger Games. They are science fiction figures with dinosaur-like heads. The sculpting is nice, and the molding is almost without any flash. In a previous post I showed the headquarters personnel and the heavy weapons. This weekend I completed the rifle squads. Most of my science fiction figures are organized like the US Army in squads of two fire teams. 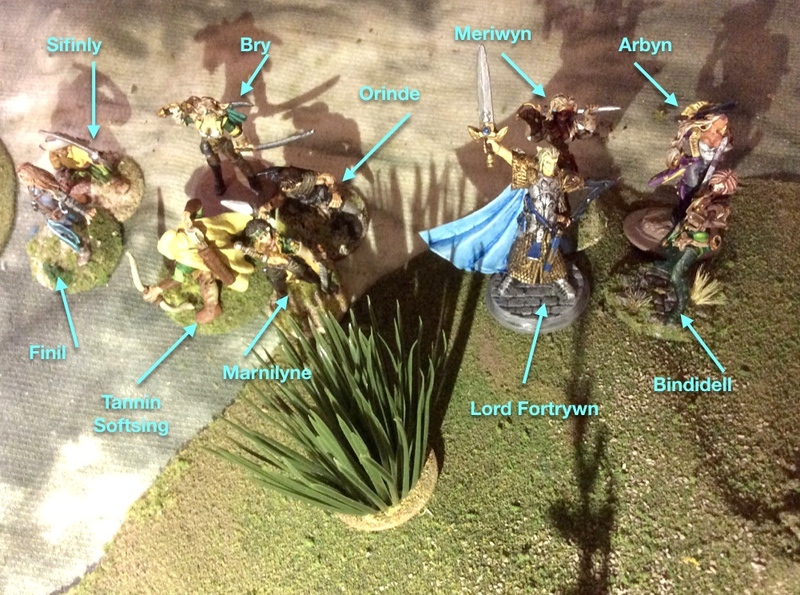 I decided that the Drantakhs would be organized more on the US Marines model of a squad leader and three fire teams. 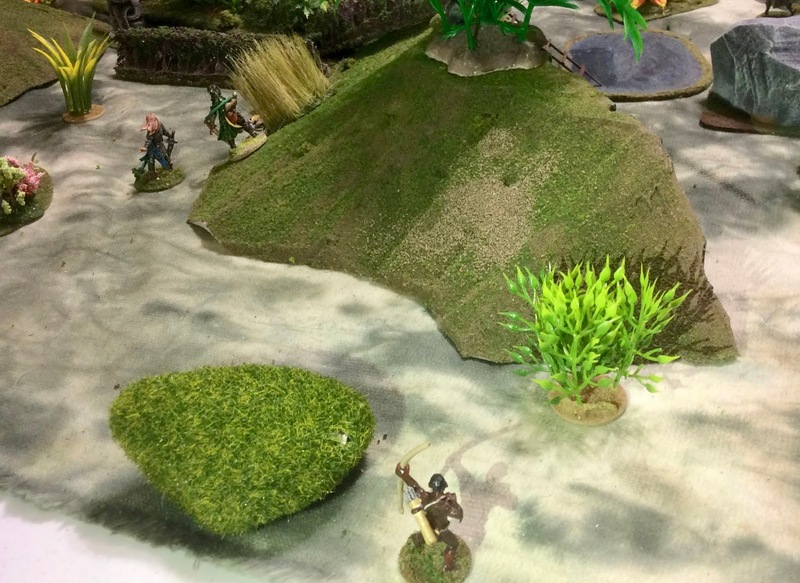 Without grenade launchers and light machine-guns in each team, this really doesn’t have much effect except that in Combat Patrol the squad will have four command dice instead of three, which should provide more flexibility and guard against those turns when no cards are drawn for any part of the squad. 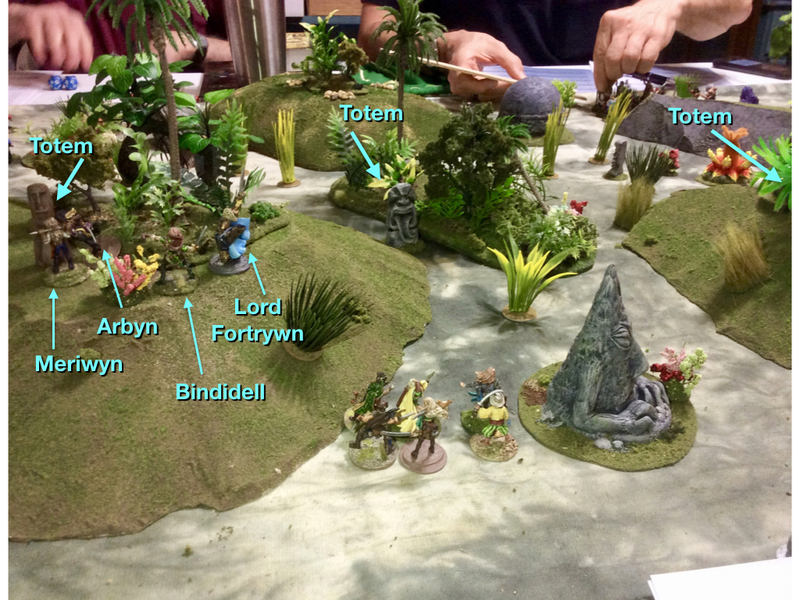 It is subtle and doesn’t show up very well in these pictures, but the small arms on each of the three teams is a slightly different color to make it possible to tell the three teams apart on the table. Lat night I completed two hover tanks to round out the Drantakh force. These required no filing or sanding; they were very clean. Some of the parts were on sprues and had to be cut off and trimmed a bit. The figures and machine-guns are separate purchases. The hatches can be glued open or closed. A close up of one of the two tanks. The the Drantakh infantry wear’s sliver, Lost-in-Space-style suits, I decided that the tanks needed some sort of camouflage pattern. (I came ver close to painting them silver too.) I like the swoopy, almost Naboo look to the tanks. While I’m not sure how you would manufacture such a vehicle, the shape of the hull would probably be very effective on the battlefield. The pronounced turret ring means they probably lose a lot of turrets and tank commanders, but maybe they have a lot of turrets stockpiled to get the serviceable hulls back into the fight. As suggested earlier, I’ll be using these with Combat Patrol™: WWII. 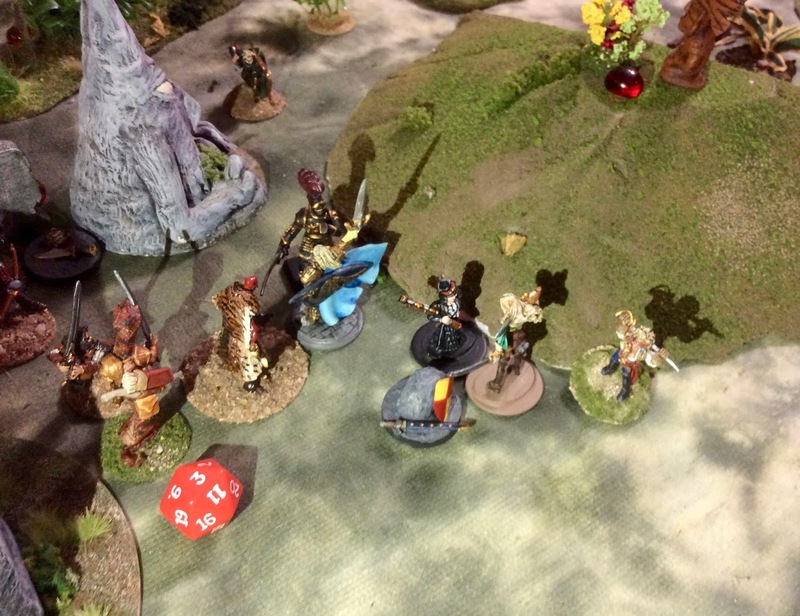 The rules work just fine for science fiction skirmish games. 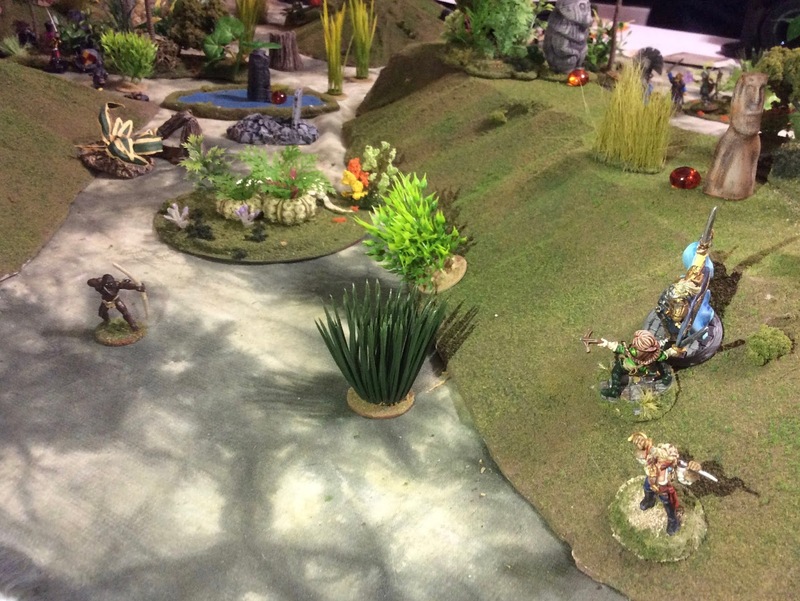 Dave Wood (right) ran a LSNC: SciFi game at our recent HAWKs night. 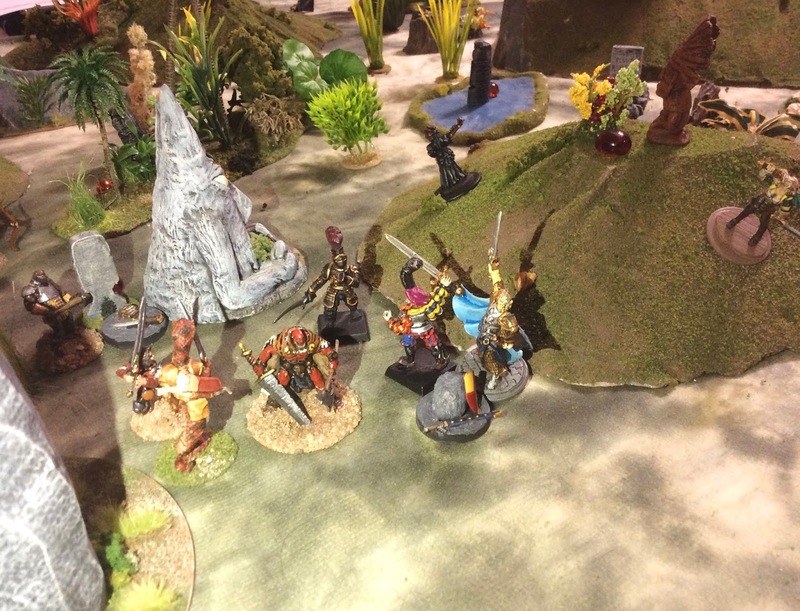 Last club night, Dave Wood ran a play test of his Look, Sarge, No Charts: Science Fiction scenario fo Historicon 2018. 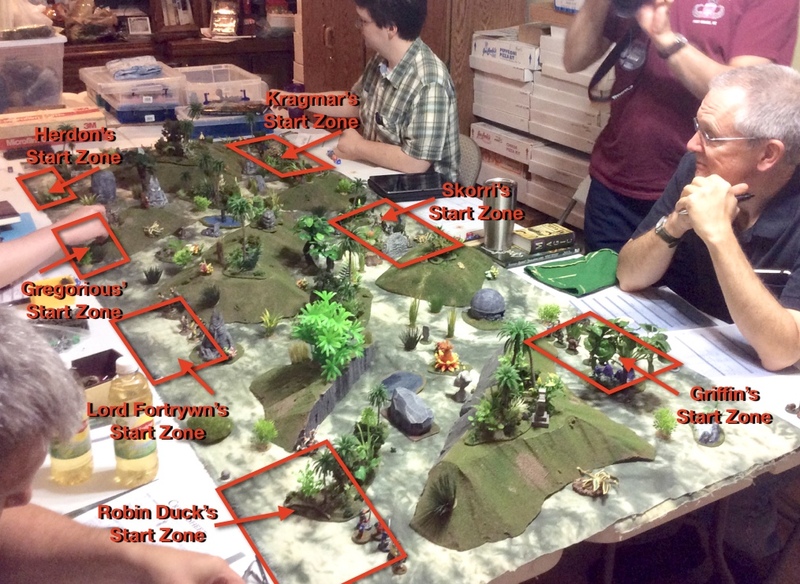 The rules have been under development, on and off, for a few years, and some aspects are starting to shape up. In particular the cyber phase is working well. I am not quite happy with the spotting rules; the issue of sensors and signatures makes things a little complicated for my tastes. The Schlegel Boys ran one side during the game. We haven’t gotten past the spotting stuff to start on RF spotting and RF-guided munitions.